This is a text-only version of the Help Guide. A full-colour version of the guide with screenshots is available in PDF format. We encourage you to use the PDF version when completing your application and have provided the text here to help with quick questions only. The purpose of this guide is to help you complete your application. The application is long and requires very specific information, so please read this guide before you begin and refer back to it as you fill in each section of the application. We intend this guide to provide supplemental information to what is already posted on our website and therefore we strongly recommend you read both, particularly the Admission Requirements, before you open an account or pay the account fee. All application fees are non-refundable. Internet Explorer does not work well with our application so please use Firefox, Chrome, or another browser when creating your account and filling out the application. It is also important that you do not copy/paste your activities or answers to the applications as this might interfere with the character count and/or cause a bug in some sections. The application can be found here. You will need to create an account by clicking on the ‘New Applicant’ tab (even if you are a re-applicant). A) If you are a re-applicant from last cycle and wish to have access to your previous application and current application in the same account, you must use the same email login and password you used to create your account last year. This will allow you to access both applications when you log in. Please note that if the email you used to create the account is now invalid, you will not be able to access both applications in the same account and should not create a new account with the invalid email. Please create a new account with a valid email address. You will have two accounts – one for your old application and one for your current application. Your old account is for the purpose of viewing your previous application only. All communication, status checking, etc must occur through your new account. B) Only applications from last year can be linked to your current application. If you did not apply in 2017/2018, please save a copy of your previous application before creating a new account for 2018/2019. You will not be able to access your previous application once you create a new account using the same email. To create an account: Fill in all the required information and click ‘Create Account’. Once you have created an account, you will receive an email that contains a specific activation link. You must click this link to activate your account. After you activate your account and confirm your email address, you will be able to log in to the application. You cannot fill in your application until you have paid the account fee of $50.00. Reminder: Internet Explorer does not work well with our application so please use Firefox, Chrome, or another browser when filling out the application. It is also important that you do not copy/paste your activities or answers to the applications as this might interfere with the character count and/or cause a bug in some sections. The application fee, which is paid immediately after submitting the application. The $50 account fee is deducted from the application fee. Both fees are non-refundable. Please read and check all boxes. Legal Middle Name, Preferred First Name and Former Name are optional; all other fields are required. Citizenship: If you hold Canadian citizenship, please select “Canadian Citizen” even if you are also a citizen of another country. The system will automatically select Canada as your country of citizenship. Permanent residents/landed immigrants must select a country other than Canada as their country of citizenship. First Language: Choose the language you feel most comfortable speaking. Indigenous applicants: We recognize Status or Non-Status Indians, Treaty, First Nation, Métis, and Inuit peoples as Indigenous peoples of Canada. If you indicate that you want to be identified as an Indigenous applicant, you must email Will Klatte, Admissions Coordinator, at will.klatte@ubc.ca and cc James Andrew, Indigenous Student Initiatives Coordinator, at james.andrew@ubc.ca to learn about the additional application requirements you must submit. Your complete application will be reviewed by the Indigenous Admissions Subcommittee, and you may be offered an interview with the Indigenous Admissions Subcommittee Interview Panel. Please contact Will at 604-822-6185 or James at 604-822-8921 for additional information, support, or questions. You will be asked to submit proof of ancestry, a photo, and an Aboriginal essay. Will or James will provide more specific details about these requirements when you contact him. Please use the Documents tab to upload these documents. Be a resident of the Yukon, NW Territories, or Nunavut and hold a currently valid health services plan card from one of those territories by the application deadline. Please note that BC CareCards are not accepted as proof of BC residency. All BC residents must meet MSP eligibility guidelines: http://www2.gov.bc.ca/gov/content/health/health-drug-coverage/msp/bc-residents/eligibility-and-enrolment/are-you-eligible. BC residents who study outside of BC or are temporarily outside of BC for another reason must be eligible to maintain their coverage according to MSP guidelines for temporary absences outside of BC: http://www2.gov.bc.ca/gov/content/health/health-drug-coverage/msp/bc-residents/managing-your-msp-account/leaving-bc-temporarily. It is the applicant’s responsibility to ensure they meet MSP eligibility guidelines. The Admissions Office reserves the right to ask for additional information or documentation about an applicant’s BC residency at any time during the application cycle. 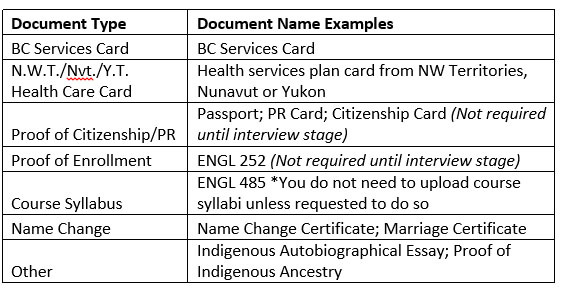 If you are not a BC resident, please say “No” to the BC residency question even if you fall under a special case where your BC residency requirement may be waived (e.g., applicants with a conferred PhD by the application deadline, Indigenous applicants, or MD/PhD applicants). Your Personal Health Number can be found on the back of your BC Services Card. The expiry date is the date your BC Services Card expires. If you have a combined BC Services Card and Driver’s License, it is the date your driver’s license expires. All applicants claiming BC residency (including re-applicants) must upload a scan or photo of the front and back of their BC Services Card to their Documents tab by the application deadline. The Documents tab provides a date and time stamp, which you can consider confirmation that you have uploaded your documents by the deadline. If you do not upload your BC Residency documents by the application deadline you will be considered an out of province applicant. The Admissions Office will contact you if there are any concerns with the document you uploaded. All fields are required. After you submit your application, you will be able to update this information on the Profile tab. Please be attentive—some questions ask you for your current educational attainments, while other questions ask about what you will have completed approximately a year from now (as of September 1, 2019). Highest degree: “Diploma” means a post-secondary diploma program, not a high school diploma. Highest degree type: Try to pick your highest degree type from the list. Only choose “Other” if there is nothing similar. If you will not complete a degree by September 1 next year, please pick the type closest to your current major. Graduate program: For this question, ‘graduate program’ means a Master’s degree or PhD and ‘this application cycle’ means the date you apply until April 30, 2019. Applicants with disabilities: You are encouraged to apply if you have the skills and abilities to successfully meet the core requirements of a medical degree. Additionally, you must have the skills and abilities to ensure your own safety and the safety of the patients you encounter during medical training. Please see the Essential Skills and Abilities PDF for the essential skills and technical standards required to complete the MD Undergraduate Program, as approved by UBC Senate. For any questions regarding the technical standards, please contact Student Affairs at associate.dean@ubc.ca. If you have a disability and wish to be accommodated in the Admissions process, please contact Access and Diversity at 604-822-5844. After you have contacted them, please message the Admissions Office through the application system to let us know you have contacted Access and Diversity. No specific information related to your disability or accommodation request needs to be sent to the Admissions Office. The message simply ensures that the admissions team connects with Access and Diversity before a file evaluation is complete. For more information on accommodations for admitted students, please see the Who Should Apply page on our website. The Faculty of Medicine will make every reasonable effort to ensure that any modified course of training will meet professional licensing requirements. However, licensing requirements and decisions are within the sole jurisdiction of the College of Physicians and Surgeons of British Columbia. We cannot guarantee that a modified course of training, which leads to the granting of an MD degree, will be accepted or recognized by this or any other licensing body. Similarly, access to the full range of postgraduate training may be limited for students with disabilities. For more information please contact the Access and Diversity office at 604-822-5844. UBC Students: Please enter your first and last name as it appears on your UBC transcript. If you would like the Admissions Office to access your UBC transcript electronically, check the applicable box. If you do not check this box you must submit an official hard-copy UBC transcript. MD/PhD Program: A supplemental application is required for this program. Please review the information posted on the MD/PhD website and complete the on-line application via the Faculty of Graduate Studies. Conferred PhD: Answer yes only if your PhD has been conferred (not just completed) and the conferred degree will appear on your transcript by the application deadline. Please enter the information for the secondary school from which you graduated. For Community Size please select the size of the community where the school was located. 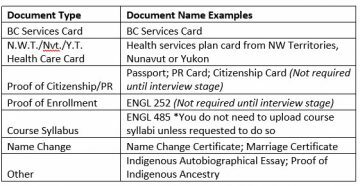 Carrying forward documents: If you applied last year and would like us to transfer your transcripts to your new file, check the appropriate box. Please note it is your responsibility to submit a new transcript if you have taken any coursework since the last time you submitted the transcript. Due to the Document upload feature we do not transfer BC residency or citizenship documents, so please upload them on your Documents tab (as a reminder, citizenship documents are not required until the interview stage). We will contact you during file evaluation if we have any questions about the proof of BC residency you uploaded. All applicants must complete two semesters (6 UBC credits) of English by April 30, 2019. In the box, please enter the English course(s) you are using to satisfy the English requirement and click the Save button at the bottom of the page. Please see the Prerequisites section of our Admission Requirements page for information about the English requirement. In this section, enter all of the post-secondary courses you have taken, are taking, or plan to take before April 30, 2019. Courses must be entered according to the academic year (September – August) they were taken, and the institution at which they were taken. Advanced Placement, International Baccalaureate or A Level exam scores should be entered if you are using them to fulfill the English requirement. Your transcripts cannot be marked as received on your Application Status page until you begin entering them on the Transcripts page. Your 2018/2019 courses do not have to appear on the transcript you submit. Note: You must fill out this section even if all of your transcripts will be carried forward to your new file. You must complete this section each time you apply. Enter your courses and grades as they appear on your transcript. 1. DO NOT convert into UBC percentages or credits. Please select the correct institution from the “School Name” dropdown menu. Almost all Canadian institutions and several American institutions are included on the dropdown menus for the appropriate province/state. Please select “Other” only if your institution is not listed. It is ok to estimate semester start and end dates (e.g., 9/1/2015 – 4/30/2016 or 8/31/2016). Please remember to check the “Degree obtained (or will be obtained) this year from this school?” box for your graduation year. 3. IMPORTANT: If your transcript lists both letter grades and percentages, enter the percentages. University of Victoria students and Queen’s University students: Enter letter grades when your transcript shows only letter grades and enter percentages when your transcript includes percentages. 4. Under ‘Course & Course Number,’ enter the course prefix and number as it appears on your transcript (e.g. BIOC 300, CHM151Y). 5. Multi-term courses: Make one entry for the course in the term the grade was awarded. 6. Thesis and other multi-year courses: Enter the course the way it appears on your transcript. For the years the course was in progress, leave the “Completed” checkbox unchecked. 7. Failed courses: Mark the course as completed and enter in your grade (either the percentage grade, F, or F Pass/Fail as applicable). Please enter the number of credits attempted for the course (do not put 0 credits, even if you did not get credit for the course). 8. Withdrawals: If you withdrew from a course and it appears on your official transcript, mark the course as completed and choose “Withdrawal” for the grade. Enter 0 credits. 9. Transfer credit: Do not enter transfer credits received. Instead, you will enter these courses when you input the transcript where the courses were actually taken. Please remember that a transcript must be submitted for all institutions attended. 10. Courses taken after June 1, 2018: Please enter courses taken or completed after June 1, 2018 but mark them as not completed (even if you have completed them). Courses taken after June 1, 2018 are not included in GPA calculations. The start date/end date of the courses may be the same or different, depending on whether you took courses at the different schools simultaneously or sequentially. The academic year runs from September to August in this section, so enter the summer courses in the applicable academic year. Summer courses from your home university should not be entered separately. Enter all summer courses that appear on your transcript. Please do not check the “completed” checkbox for summer 2018 courses. Enter the courses you plan to take. a. if you change your mind about which English course you will take, you must message us to tell us the new course name, number, and institution. b. if you are completing 90 credits and change your courses after you apply, please message us with your new courses. Create an entry for WES or ICES (they are listed under the BC institutions menu, so select Canada and then BC to find them). Please enter the Canadian grades listed on your WES or ICES evaluation. Next, create a new entry for the foreign transcript. For the year please select the last year you attended the foreign institution. If you have entered your WES or ICES grades, you do not need to enter any grades from the foreign transcript. As long as there is an entry for the foreign institution we can acknowledge your transcript as received, even if there are no grades entered. Create an entry for the foreign institution and enter your grades according to the transcript, even if the grading system is different. For example, if you received a grade of 12 on a 15-point scale, select 12. We understand it is not the same thing as a grade of 12% and will make the necessary adjustments when we evaluate your file. If your school’s grading system cannot be represented by the available options (for example, ‘good/very good’ or ’15.5’) please estimate your grade on the standard A+ to F scale and enter that. We will make the necessary adjustments when we evaluate your file. We will still consider those courses according to the September – August academic year, so try to shift the start date or the end date a bit so the courses can be entered in the appropriate year on the application. For example, if you are entering courses from semesters that ran from Feb – May 2014 and June – September 2014, the first semester would clearly fall in the year September 2013 – August 2014. The second semester isn’t exact, but since three out of the four months fit within the year September 2013 – August 2014, it is appropriate to enter the second semester courses in that year as well, with an end date of August 31. Enter your name as it appears on the MCAT Score Reporting System. Enter your 8-digit AAMC ID. You must send your MCAT scores to UBC via the Score Reporting System by October 1, 2018 at 12:00 noon Pacific Time. You must release your scores to UBC each year you apply. Please note: UBC is not part of the AMCAS system. Test dates from April 17, 2015 - August 25, 2018 are accepted. MCAT statuses will be updated starting in July. This section is for awards or prizes of any kind (e.g. scholarships (athletic, academic, or non-academic), academic prizes, community service awards, etc.). The description should include the criteria for how this award was given. Please provide no more than five most significant awards received from grade 11 onward. Please do not include awards you were offered but did not accept (e.g., entrance scholarships from a university you did not attend). You must have received the award by June 1, 2018 in order to include it on the application. It is not sufficient to be notified about the award by June 1. You are required to provide a website link to information about the award. If no website exists, please provide the website of the awarding institution or organization. This section is not required to submit the application. You can save and continue without adding any entries. This section captures information about your research publications and presentations. Research/lab experience, non-academic presentations and personal writing should go in the Non-Academic Activities section instead. If your publication is accessible online, please provide a URL link. Alternatively, you can provide a link to the library catalogue page that lists your paper publication. If neither is available, you can enter “n/a”. Please enter the Digital Object Identifier (DOI) number for your publication in the field provided. Enter “n/a” for a presentation, or if your publication does not have a DOI number. Please include only publications you have authored or co-authored (1st or 2nd author). If you are a 3rd or subsequent author, do not include the publication here. Instead, you may wish to integrate a note about your contribution into the description section of the related research activity, which would fall under Non-Academic Activities or Employment History section as applicable. Similarly, please include only presentations that were presented by you. If you worked on a poster or paper presented by someone else, do not include the presentation in this section. There is a cutoff date of June 1, 2018 for this section. Do not include future submissions: everything you include must have been published on or before June 1, 2018. Presentations must have been presented on or before June 1, 2018 in order to be included in the application. Please check the “Part of Program Requirements?” box if the publication was a required part of your degree or other program; for example, a published Master’s thesis. You are limited to 12 entries in this section. This section is not required to submit the application. You can save and continue without adding any entries. For the Non-Academic Activities, Employment History, and Northern and Rural Training sections, you are required to provide the contact information of a person who can confirm the date, hours, description, and other activity details listed on your application. These people are called verifiers, and can be contacted at any time during the application cycle. Unverifiable activities (no phone or email provided) will be disregarded. Do not use yourself as a verifier. We will disregard these entries. It is not advisable to use the same verifier for numerous entries. Do not combine activities with different verifiers, unless the one verifier can confirm both activities and the activities were conducted at the same institution. Verifiers for structured activities—such as volunteer or work experiences—should be people who worked with you in some sort of supervisory capacity. For instance, a co-worker or fellow volunteer is generally not considered to be an appropriate verifier. Family members or close friends should not be used as verifiers except where appropriate or absolutely necessary (for example, solo travel experiences or solitary hobbies). If an institutional email address is available for your verifier, please put down the institutional email address rather than their personal email address. We cannot tell you who to choose as your verifiers. If you are unsure whether or not someone is an appropriate verifier, please use your best judgement and refer to the above criteria. Important: Discrepancies between the details in your application and those confirmed by the verifier are noted and may have a serious negative impact on your application. Double check your hours, dates, description and other details with the verifier to make sure you are entering accurate information in your application, and review your entries carefully before submitting to make sure you have typed the hours, dates, and other details correctly. Please confirm that your verifier’s contact information is accurate and has been entered correctly before submitting your application. If you notice a mistake after submitting your application, you can update your verifier’s contact information (see the Updating Verifier Contact Information section in this guide). This section captures information about your non-academic activities. We want to know about activities and experiences that have made you who you are today and have helped you develop capacities like altruism, leadership, the ability to work with others, etc. Please see our website for more information on the non-academic qualities we are seeking. We encourage you to think outside the box when deciding which activities to include. Activities of interest to us are not limited to “typical” premed activities such as hospital volunteering or research lab work. We also value experiences such as parenting, overcoming adverse situations, and your hobbies and interests. We are interested in learning more about you through your non-academic qualities and experiences. This means that we would like to know what you have been doing, what you are passionate about, and how you spend your time. We do not want to know how you are like a doctor, and encourage you not to think about your application in such a limited way. Please include experiences that will tell us something about you, even if they are not your greatest achievements or accomplishments. However, also be aware of how committed you were to that activity. If you participated in an activity for one day or one week, we are not likely to consider this as illuminating as activities that you have participated in over the longer term. We are primarily interested in your particular role in an activity and the contribution you made to the activity or through the activity. Giving us a clear, specific description of the context, duties, and people involved in the activity will help us evaluate this section more accurately than a summary of what you learned from the activity. Please note each category is limited to a number of activities that you can list. Research publications and presentations, awards, and paid experiences (employment history) should not be included in your list of non-academic activities. Please describe these experiences in the appropriate areas of the application. You may include non-paid research/lab experience in this section. We will review your work history for evidence of the same qualities we seek in the Non-Academic Activities section, so please put paid employment in the Employment History section. This includes any paid research work and research work that was grant funded. Please list each activity only once, even if you think it fits into more than one category. It is up to you to decide which activities to include and under which categories to include them. The Admissions Office will not provide advice or guidance about this. Please do not contact us. You will not be penalized for putting an activity in the ‘wrong’ category. There is a cutoff date of June 1, 2018 for this section. The system will not allow you to enter a start or end date later than June 1, 2018. Leadership is defined as the capacity or ability to lead, a person who commands, guides or inspires others. Qualities include, but are not limited to, initiative, motivation of others, providing vision and implementation, personal and professional development, and decision making. These experiences exhibit involvement in activities that demonstrate participation for the benefit or welfare of others. Consideration is given not only to the length of time devoted to a particular activity, but also the overall continuity of commitment over time, level of involvement, types of roles and responsibilities held, whether activities are considered outside an applicant’s “comfort zone”, and demonstrated preparedness for a career in medicine. When considering your entries for this section, please note that experiences demonstrating service ethic are not limited to those pursued as part of a formal volunteer organization. Applicants are encouraged to include experiences that occur within both recognized agencies/organizations and those that are done independently or in an unstructured environment. Applicants will need to ensure that they are able to provide verification for each of their listed activities. This category recognizes applicants’ abilities to work with groups which take them beyond their peers, friends, school and co-workers. Consideration is given to an applicant’s experience and knowledge gained from working with groups and individuals including, but not limited to, customer service teams, diverse age groups, cultures different from one’s own (immersion), socio-economic backgrounds other than one’s own, individuals with physical, cognitive or developmental disabilities, sexual orientation, etc. Active participation in events or activities leads to the accumulation of knowledge and skills. These experiences can be attained through, but are not limited to: travel, sports, cultural events, music/theatre/arts, etc. We recognize that hours for activities that fall into this category can often be hard to calculate. For total hours, please use a conservative estimate of the time you spent on the activity over the period listed. Note: In the “Description” box, indicate your level of involvement with this activity, your role, and what you have achieved. For travel experiences please do not include sleeping time. If you were performing a specific role (such as working or volunteering) while traveling please calculate your hours as only those you were actively involved in the activity. If you combined travel for fun and work/service, please use the additional clarifications box to explain the calculation of your hours. Occasionally, applicants have been or are involved in one or more activities at a level that exceeds what can be expected of a typical applicant. These individuals receive recognition in a provincial, national or international arena by way of an award, honour, ranking etc. If you have attained a high level of performance in an activity or received an exceptional level of recognition, please provide the details. You can list up to 3 entries in this section. Note: In order to ensure that your experiences in this category are properly assessed, please provide very specific information (i.e. date of highest level achieved) and avoid the use of acronyms for organization names, titles, awards, etc. Additionally, please ensure that web addresses are entered in their entirety, including http:// or https://. For the High Performance category only, please do not include any accomplishments that were achieved before June 1, 2012. We are interested in hearing about relatively recent achievements that tell us about who you are today. The application system will not allow you to enter a date earlier than June 1, 2012. Please do not choose this date to represent another earlier date. Chosen dates MUST accurately reflect the date of a major competition or awarding of an honour. The chart below provides a range of examples in regards to what you might include as part of your non-academic activities. One set is not more “right” or better than the other; instead, this list is intended to illuminate the wide range of activities that should be considered for inclusion. This list is not definitive and you may have a variety of other activities and experiences you wish to include on the application. As a reminder, the final decision about which category to use for an activity or experience is yours. Time Period: Please select the option that is most applicable. If you select “Other – Please explain in clarifications box”, it is mandatory that you provide an explanation in the box at the end of the entry. This option should be selected if the activity was performed on an irregular schedule. For example, if you were a volunteer camp counselor for a few weeks at different points in the year, this should be specified. E.g. “I volunteered for 2 weeks every March from 2011 – 2015, and for 3 weeks each July in 2011, 2012 and 2014”. Start Date: The calendar feature is optional; you can type the date and click outside of the box to set it instead. End Date: If an activity is current or ongoing, enter an end date of June 1, 2018. Total Hours: Please estimate the total number of hours you have participated in this activity as of June 1, 2018. Do not put “0” hours for any activities. Please provide an estimate even if it is difficult to determine. Generally the Admissions Office will consider the number of hours you participated in the activity in conjunction with the overall length of your involvement. This helps us to gauge your level of commitment to the activity. If the activity was performed on an irregular schedule or if there is something else you wish to clarify about your participation in this activity, please explain in the box provided. Note: this box is not an extra description box. It is for clarification only. Highest Level Achieved (only in High Performance category): Please provide the highest level you achieved in this activity. Course Credit Received: Please check this box if you received course credit for the activity. Do not check this box if the activity was part of an ungraded co-op program, even if you received credit toward a co-op degree. Co-op: Please check this box if the activity was part of an unpaid co-op experience. Paid co-op experiences should be listed in Employment History. Please note that a practicum does not count as a co-op experience. A practicum is considered an academic program requirement and is not a non-academic experience, even if it relates to health care. Contact Information: Please ensure you have read the “About Verifiers” section above before proceeding. Discrepancies between the details in your application and those confirmed by the verifier are noted and may have a serious negative impact on your application. Contact First/Last means first name/last name. Contact Job Title refers to your contact’s job title as it relates to your activity. If your contact is no longer at the same position, please briefly explain in the clarifications box. Contact Phone and Email: Both are required. Please enter your verifier’s current email and phone number. If your verifier does not use email, enter N/A in the email field. Please make sure there is no extra space at the end of the verifier’s email address. The verifier form will not work if there is an extra space. Please see the PDF version of this guide for an example of the sort of information required when you enter your activities. Note: Activities must be added using the Add button (the Save and Continue button will not save or add the information typed in the text boxes). A minimum of one non-academic activity is required to submit the application. It can be in any category. Please start with your most recent position. This section has a cutoff date of June 1, 2018. The system will not allow you to enter a date later than June 1, 2018. Institution: The company, organization, or employer you worked for. End Date: If an employment position is current or ongoing, please enter an end date of June 1, 2018. Time Period: Select the appropriate description. If you select “Other – Please explain in clarifications box”, it is mandatory that you provide an explanation in the box at the end of the entry. This option should be selected if the activity was performed on an irregular schedule. For example if you were a camp counselor for a few weeks at different points in the year, this should be specified. E.g. “I worked for 2 weeks every March from 2011 – 2015, and for 3 weeks each July in 2011, 2012 and 2014”. Hours per Week: If your hours varied, enter the number of hours per week you most frequently worked and explain your hours in the box provided. For example, if you worked 10 hours per week during the school year and 40 hours per week during summer, enter 10 hours. Then write a short clarification of your schedule in the “Please clarify the dates/hours/frequency of this activity...” box. Description: Describe your job duties and responsibilities. Course Credit Received: Please check this box if you received course credit for your work. Co-op: Please check this box if your employment was part of a co-op experience. Contact Information: Please ensure you have read the “About Verifiers” section above before proceeding. Contact Job Title: The contact’s job title at the time of your employment (e.g. Director, Supervisor, Manager, etc). If your verifier is no longer in the same position, please explain briefly in the clarifications box. Contact phone and email: Both are required. Please use your verifier’s current email and phone number. If your verifier does not use email, enter N/A in the email field. Please make sure there is no extra space at the end of the verifier’s email address. We may contact your employers for verification so please ensure these details are accurate. Check with your verifier to make sure you are entering the correct dates, title, description, hours per week, etc. Discrepancies between the details in your application and those confirmed by the verifier are noted and may have a serious negative impact on your application. Applicants who have a genuine interest in rural, remote, or northern medicine should complete this optional section. Applicants who do not complete this section will not be considered for admission to the Northern Medical Program or the seats designated for rural, remote, or northern applicants at other program sites: this includes up to 10 seats at the Southern Medical Program and new this year, up to 2 seats at the Island Medical Program. However, applicants who do not complete this section will still be considered for admission to the non-rural seats. Applicants who do complete this section are also considered for admission to the non-rural seats. This section captures information about your suitability for training in the Northern Medical Program (NMP) as well as for the rural positions in the Southern Medical Program (SMP) and Island Medical Program (IMP). Applicants with experience in rural, remote, northern, or Indigenous settings are encouraged to complete this section. NOTE: The Rural and/or Northern Training section is evaluated separately from the rest of the application. Please ensure you include any relevant non-academic experiences and employment history in this section that you may have already listed in other sections within your application. If you are not interested in this type of training, please DO NOT check the box next to “I want to be considered for the Rural & Northern positions in the UBC MD Program.” You will not be considered for the rural program seats. This section requires verifiers. Please ensure you have read the “About Verifiers” section above before proceeding. It is appropriate to use friends and family members as verifiers for some activities in this section, as described below. As a reminder, discrepancies between the details in your application and those confirmed by the verifier are noted and may have a serious negative impact on your application. *Note: Some versions of Internet Explorer cause a bug with this section of the application (information does not save properly). Please use a different browser to complete the application. Rural Interest Statement: Please outline your suitability/experience/interest/future intentions for rural and/or northern training in the text box. Lived Experiences in Canada: In this section, you will list the Canadian locations you have lived from birth until June 1, 2018. Please include all the places you have lived in Canada, even if the location was not rural, remote or northern. Do not enter places you have lived for less than three months. Note: if you lived in a city or town but frequently traveled to a family cabin/relative’s house/etc which was situated in a rural area, we do not consider this as a lived experience. Please do not mark this rural area as your place of residence unless you physically stayed there, uninterrupted, for three months at a time. You may make note of this experience in other parts of this section like rural ties or relevant activities. Please enter Canadian experiences only when completing this section. When you start typing a location in the city and province/state box, locations starting with those same letters will appear. Please type slowly enough for your location to pop up. If a location you need is missing, please message the Admissions Office through the application system so the location can be added to the list of locations. If you were born in Canada: start with the place you were born. Select Canada, and then enter the city and province where you were born. The start date for Age 0-4 is your date of birth. If you were still living in the same location when you turned 5, the end date is the day before your 5th birthday. If you moved to a new place one time before you turned 5, the end date is the last day you lived in your place of birth. Then you would create a new entry for the new location (age is still Age 0-4 (Pre-School)), with a start date of the day you moved to the new location. The end date for this entry would be the day before your 5th birthday. Fill out the other ages in a similar manner. When you start filling out Age 5-12 (Elementary School), the start date will be your 5th birthday. The end date for this age will be the day before your 13th birthday. You might have more than one entry per age, depending on how many places you have lived. The end date of your last entry should be June 1, 2018 unless you are currently living abroad. If you are currently living abroad, then your last entry date should be the last date you were residing in Canada. If you were born outside of Canada: Determine how old you were the day you started living in Canada and select the appropriate Age category. The start date will be the day you started living in Canada. Select Canada and enter the city and province where you first resided in Canada. If you were still living in the same place when you reached the next age category (when you turned 5, 13, or 18 years old), the end date is the day before your 5th, 13th or 18th birthday. If you moved to a new place before reaching the next age category, the end date is the day before you moved to the new location. Then you would create a new entry for the new location, keeping the same age category. The start date for the new entry is the day you started living in the new location. The end date is the day before your 5th, 13th, or 18th birthday as applicable. (Unless you moved again – then the end date would be the last day you lived in your old location and you would repeat the process, adding a new entry for the new location). Fill out the other ages in a similar manner. You might have more than one entry per age, depending on how many places you have lived. The end date of your last entry should be June 1, 2018 unless you are currently living abroad. If you are currently living abroad, then your last entry date should be the last date you were residing in Canada. Please remember to fill out the ages according to the actual ages listed, not according to how old you were in pre-school, elementary school, etc. Use the first and last dates of the month if you are not sure about the exact date. Dates should be sequential – the system will not allow you to enter overlapping dates. Please see the PDF version for some examples of how to enter Lived Experiences in Canada. Verifiers: Family members are acceptable contacts from ages 0-17 and for post-secondary education. For post-secondary employment or other experiences, however, please list an employer or other person who can confirm the dates of your residence in the location. Rural Capacities (Relevant Activities, Ties, and Mentors): This section allows you to demonstrate your connection to rural and/or northern areas through activities and relationships, which further helps capture your suitability for rural and/or northern training. As a reminder, you may include activities, employment, or other information that is already listed elsewhere on the application. For each entry in this section, please include a short description. Special instructions for each capacity type are listed below. You must provide the contact information of a person who can confirm the details you list for each entry. In this section, you are allowed to include activities, relationships and mentorship experiences that took place inside or outside of Canada. Notes: You may enter both Canadian and non-Canadian locations for this section. Canadian locations will pop up after typing a few letters, but non-Canadian locations must be typed in full. If a Canadian location you need does not appear, please message us so it can be added to the list of locations. You will not be able to select the location until it has been added. There is a cutoff date of June 1, 2018 for this section. The system will not allow you to enter dates after June 1, 2018. Relevant Activities: 10 entries allowed. We are looking for activities relevant to northern, rural, and/or remote living. These activities can include outdoor, leisure, hobbies, volunteer or community-based work, employment activities, etc. As with the non-academic activities section, you are welcome to include non-traditional activities such as farming or tree planting. Please provide a description of the activities in the Description box and enter the number of hours you have spent participating in this activity in the Total Hours box. If the activity was performed on an irregular schedule or if there is something else you wish to clarify about your participation in this activity, please explain in the “Please clarify…” box provided. Note: this box is not an extra description box. It is for clarification only. Ties: 3 entries allowed. Please type the name/title of a person (e.g. Mother, Father, Sibling, Cousin, Partner, Grandparent, Friend, etc.) through whom you have a tie to a rural, remote, and/or northern area in the Activity Name box. The start date should be the beginning of your relationship with the person. For the description, please explain a bit more about your relationship to the person, such as how often you visit them, how long you lived together if applicable, etc. If the person no longer lives in the rural community you indicated, please note when they moved in your description as well. In most cases, the verifier will be the person with whom you have the tie. Role of Mentor in Decision to Pursue Medicine: 3 entries allowed. This section is about northern, rural, and/or remote mentors who have influenced your decision to pursue medicine. Enter the name/title of the mentor in the Activity Type box. The start date should be the date the person started to play a mentorship role in your life. For the description, please describe the relationship or connection you have with the person, and explain how the mentor influenced your decision to study medicine. Please enter where your mentor lived/lives. If your mentor no longer lives in the rural community, please note when they moved in your description. In most cases, the verifier will be your mentor. Exceptional circumstances text box: This is an optional opportunity to explain any challenging circumstances that have had an impact on your application. It is not a chance to write an autobiographical essay on your motivation for medicine, your background, etc. Clarify something about your application text box: This box is a chance to provide additional information about an aspect of your application, if you need to. It is optional, and as above, should not be used to describe your motivation for medicine, etc. If you are getting your degree completely online, please write a brief explanation about why you chose online course delivery vs in person (limited access to physical institutions, reason for needing a flexible schedule, etc.) No explanation is necessary if you are taking only some classes online. Site preference selection: You must select one and only one first choice preference. You may choose 2nd choice, 3rd choice, 4th choice, or no interest to the remaining sites. This question is for informational purposes only. Your selections are not binding. Optional Questions: These questions are for quality assurance and process evaluation purposes only and will not be provided to the Admissions Subcommittee or used to determine your suitability for the medical program. Parental Education and Occupation: Please select the educational level and occupational category of the parent/guardian who has had the most influence on your life first. This will be Parent/Guardian 1. You must enter at least one parent/guardian and may enter up to four. If you wish to enter more than one, please select the parent/guardian who had the second most influence on your life for Parent/Guardian 2, and continue in order for Parent/Guardian 3 and Parent/Guardian 4. This question is for information only and is not used for selection purposes. First in Immediate Family to Attend University: Please answer no to this question if either of your parents or guardians attended university for more than two semesters. If your parent/guardian(s) attended college, an institute of technology, and/or other trade- or industry-related school but not university, you may answer yes. If the school of your parent(s) has changed from a college to university, answer the question based on which type of institution it was when your parent(s) attended. This question is for informational purposes only and is not used in admissions decisions. Government student loans: If yes is selected, please enter your current total government student loan debt in Canadian dollars. This question is for information only and is not used in admissions decisions. There must be a green checkmark beside each section (except for Application Fee) before you can submit your application. If any section has a red exclamation mark beside it, go back to that page, review it and hit save and continue. Please review every section of the application carefully. You cannot make any changes once you submit. IMPORTANT: You must pay the remaining application fee after submitting your application. If we do not receive the complete application fee by the deadline, your application will be ineligible. You will receive a confirmation email after your application is submitted. You are still required to pay the remaining application fee in order for your application to be considered complete. The system automatically calculates your application fee and deducts the $50 account opening fee. All application fees are non-refundable. You can make sure your application fee has been received by checking the Application Status page. Application fees will appear on your banking statement as UBC E-Payment. Please call 604-822-2008 with any questions or concerns about your transaction record. The Application Status tab is where you can check the status of your online application, transcripts, proof of BC residency, application fee, and MCAT scores. Other items are available on the Application Status tab later in the application cycle. As a reminder, your transcripts cannot be marked as received until you have started entering them on the Transcripts page. The month and date your transcripts were received is provided to help applicants carrying forward transcripts know if we have received the most updated version of the transcript. To upload documents, click on the Documents tab, then select the type of document from the dropdown menu and type the name of the document in the Name field. Please see the chart for examples of document names. Next, click the “Choose File” button and select the file from your computer. When you have selected the file, click the “Upload” button. You will see a message that says “File has been uploaded.” In addition, the name of the document will appear under the Document column, the type of document will appear under the Type column, and the upload date and time will appear under the Uploaded column. If you do not see the document under the Uploaded Documents section, make sure you clicked the “Upload” button. If that doesn’t work please try uploading the document again. As long as you upload the correct document by the deadline required, we will consider it received on time even if the status for that document says “Not Received.” The status of your document will be changed manually by the Admissions Office. *Note: if you change your email address you will receive our emails at the new address, but you must still use the old address to log in. After you submit your application, you can return to the Non-Academic Activity, Employment History, and Rural and/or Northern Training pages in your application and update the phone number and email address of your verifiers. You cannot change the verifier’s name. To make the changes, click on the appropriate page, find the entry, press edit, change the phone and/or email, and press update. Please make sure there is not an extra space at the end of the verifier’s email address. You do not need to inform the Admissions Office that you have updated your verifier contact information. If you notice a mistake with the dates, hours, description, grades, or academic years in your application after it has been submitted, please message us with the correct information. You do not need to contact us about minor typos. Messaging: Please message us through the application system rather than using email. To message us, click on Communication, type your message, and hit Send. To reply to our emails, click on Communication, then Communication History. Click “View” next to the message you want to answer, type your reply, and hit Reply. To include an attachment with your message, click the Add Attachment button, select the file, and hit the Upload button. The document will not be attached unless you click Upload. Please note that most documents should be uploaded through the Documents tab rather than attached to a message. Phone: We prefer that you message us, but we are also available by phone between 1:00 p.m. – 4:00 p.m. Pacific Time, Monday – Friday, excluding holidays. Our phone number is 604-822-9911. All transcripts and other postal mail must be sent to this address. We are not responsible for mail addressed to our physical location, to other Faculty of Medicine offices, or other UBC departments. Transcripts sent to the main undergraduate admissions office for UBC (in Enrolment Services) are unlikely to be forwarded to our office. Please be sure your transcripts are directed to the correct address. Mail can be dropped off in person to this address between 8:30 a.m. – 4:30 p.m. Pacific Time, Monday – Friday, excluding holidays. This address is for sending and dropping off mail only; no one can answer questions about the admissions process. Please see the Documentation Checklist for 2018/2019.